First things first, let me just say that Tiffany McDaniel is an incredible writer. I was lucky enough to be sent a signed copy of her book for review and it did not disappoint. Her prose is beautiful and poetic from start to finish, her characters are intriguing, her story is dark, haunting, and relevant. This book does not feel like the work from a debut author. And yet. 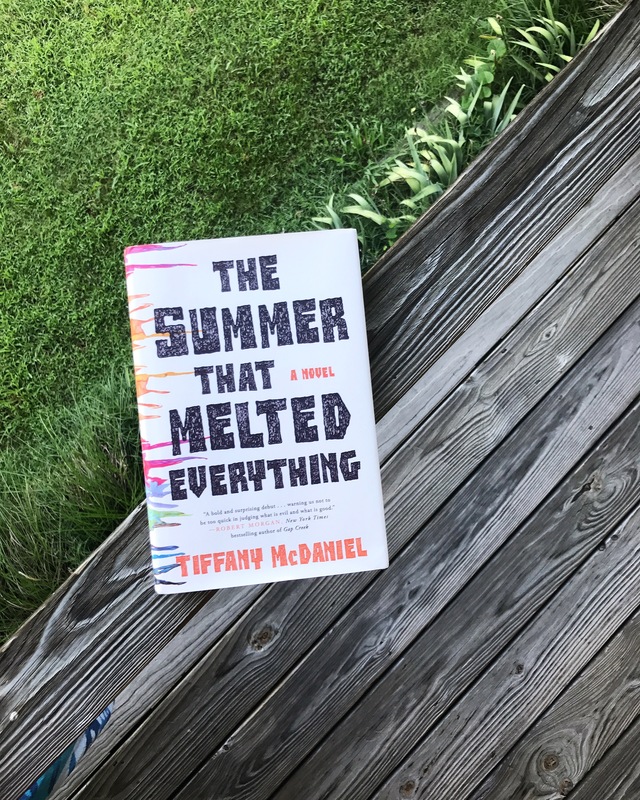 The Summer That Melted Everything is the story of a thirteen-year-old boy named Fielding Bliss and the summer of 1984, “the year a heat wave scorched Breathed, Ohio. The summer he became friends with the devil.” When a boy named Sal arrives in the town of Breathed claiming to be the devil, Fielding and his family take him in. Others in the town are more skeptical, and as horrific events start to take place and as the temperature rises hotter and hotter, many in the town think Sal is to blame. This story is a coming of age story–more specifically it is a story about the loss of innocence. It is about a horrific summer that tears a town, a family, and a boy apart. It is a commentary on racism and sexuality in a small Ohio town in the 80s, with ideas that are still relevant today. It is abut a boy who calls himself the devil, but really brings out the devil in the town. This is the year 1984 we’re talking about. The year George Orwell said we would be convinced two and two makes five. He proved, through story, mind is controllable. These people have proved through reality no different. I loved these literary nods and references and found that they added to the depth and scope of the novel. I was completely immersed in this story. I was right there with the Bliss family as they learned to love Sal but were frightened by the terrible events happening around them. I loved the stories and the details that supplement the main plot; the stories Sal tells (some of which are metaphors and some very well could be true), could be short stories or prose poems in and of themselves. This book is not for the faint of heart… it is brutal and heartbreaking. It tackles head on issues such as racism, child abuse, homosexuality in a conservative small town, A.I.D.S., and mob mentality. It is hard to read at times. But it is so beautifully written. It is moving and shattering and full of thoughts and ideas to chew on. It will break your heart over and over again. It’s almost too much for a single book. I find myself feeling as though McDaniel tried to talk about too many issues. How many terrible things can happen to a single family? A small town? Death after death, and yet… it felt like every bad thing that happened had to happen in order for this story to be told. As I write this review, I wonder which of these things I would remove and I’m at a loss. It seems like too much, yet I can’t imagine this story any differently. I am torn because I want to believe in the possibility of a happier ending, I want to be optimistic and hopeful that there is good in these people. But this book defies that wish at every turn and still I find myself drawn to it and mesmerized by it… Fielding and Sal and their story in the summer of 1984 will be sticking with me for a long time. I am very much looking forward to whatever Tiffany McDaniel writes next.